How to promote a dating app – find a few beautiful models with catchy faces, have a news channel feature it, and people will flock to the app like bees to honey. Imagine locking your eyes with a stranger on the subway – what are your actions? The first step is mortifying unless you are a very-very self-confident person. Then again, it is socially more acceptable for a guy to make the first step, so being the guy, you face a tough call to have your interest potentially rejected. For a woman, it takes a lot of recklessness to approach a guy first. Happn makes that first step easy. If both you and your sudden object of interest just happen to be using the app, it will let you both know you are open to new experiences. In other words, Happn maps out the network of people looking for a date. It registers all Happn users that come your way, and you can scan that log to get in touch with the one you like. Apps like this have been circulating on the market for quite some time now. The notorious Tinder has generated a lot of love and hate at the same time. It’s also been at the center of a security scandal when users revealed Tinder’s location is not as approximate as the company claimed. Before Tinder, there was Meetic and the likes of it, with a huge amount of dating websites, paid and free, that have huge audiences. They allow users to filter the search according to nearly every criterion one could think about, including the users’ credit score. If there is one thing, however, that these websites or mobile apps can’t tell you for sure is whether the people behind the profiles are the ones they see on the pictures, which too often is the reason of scam, fraud and other nasty traps set by predators for inexperienced love seekers. 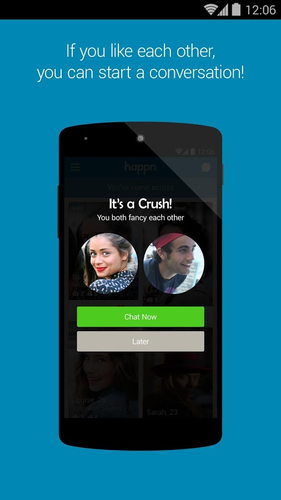 Happn makes things certain – what you see is what you get, and all there is left to do is ping that good-looking stranger, and he or she will see your profile in the Happn network and will be able to either welcome your interest, or reject it. And you won’t even have to think of something witty to say as an ice-breaker. Ladies will be able to send a ‘charm’ to a person of interest for free while gentlemen will enjoy the same privilege for a small fee. Another interesting feature is users aren’t able to talk to each other unless both of them express interest. It’s a French project and the app is gaining traction in Europe, with users expressing their positive experiences with the app itself and waiting for the audience to grow. Currently, it is popular in large European cities, for example Berlin and London, and developers reported Happn already generated over 350.000 users, with over 100.000 users who are active daily. On the one hand, with over seven billion people in the world, finding that special person sometimes seems impossible, and people are forced to use technology to widen the search area. On the other hand, apps like Tinder and now Happn seldom work for relationships, but rather for easy hooking up. As with all things easy, there comes a catch – security and privacy. With the geo-location always on, Happn might be a source of serious trouble (not to mention the battery drain), and just like we heard Tinder swear location is only ‘approximate,’ Happn repeats the claim, adding the app does not track user’s locations, but only signals when users cross paths. However, it does keep a log of all the Happn users you come across during the day. If you should not get interested in an invitation, you can just reject it, and the user will never appear in your log again. Also, Happn offers a way to report unwanted behavior, or even block a user from appearing on your radar. Time will show whether the app stands up to the claimed standards or privacy. Another feature that can be both a lure and a privacy concern is Facebook – users can only sign up for Happn with their Facebook account, the worst of them all, as far as privacy is concerned. One thing is certain – dating apps are the golden mine because people will always want to hook up. As the song goes, ‘Somebody wants to abuse you, somebody wants to be abused.’ Be careful with those sweet dreams because sometimes they turn into nightmares, and online or mobile dating is no different from a Russian roulette. 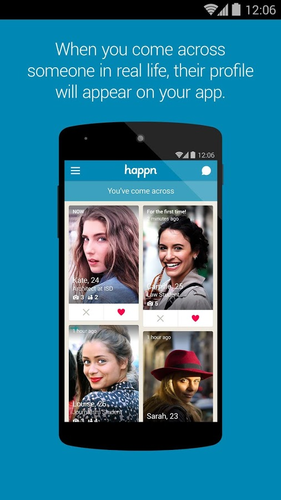 If you are a daring kind, have a go with Happn. It’s available free of charge on Google Play and iTunes store.